With its "2-Step Twist" custom-brush system, this ingenious mascara combines simplicity and expert performance for an instantly professional result. Enriched with premium deep black pigments and natural protective oils (jojoba, olive and avocado), its extra-workable texture may be stretched out and touched-up to create any look without ever smudging or flaking. I love the twist option—sometimes I just want longer lashes, and sometimes I want curled, so it's great that one bottle can do both! 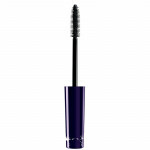 This mascara produces stunning results! It’s super innovative the way you can twist it to change the brush for a different effect. I am in love! !